Subject to the approval of the new charge by the Selectboard on April 5, 2019, the committee has two areas of focus: Climate Change Mitigation, and Climate Adaptation Action. The committee also has two constituencies: the Town government and the individual residents, homeowners, and businesses of Wellfleet. Climate Change Mitigation essentially consists of reducing greenhouse gas emissions in three ways: renewable energy generation, energy efficiency, and conversion to cleaner forms of energy. Townwide efforts for greenhouse gas reductions are part of our efforts under the Global Covenant of Mayors. We are developing a survey to help with this effort. Climate Change Adaptation is the new aspect of the committee’s charge. As a low lying community, surrounded by bay and ocean we not only enjoy our environment but need to plan for the inevitable sea level rise and its consequences. The committee will be seeking two new members to help with the expanded workload. Please consider joining us in this effort. To further climate change mitigation the town adopted the Green Communities Act in 2014. 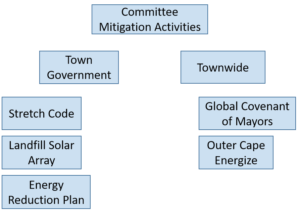 We developed and have been acting on a plan that measures and reduces the town’s overall energy consumption, adopted a stretch code that accelerates energy conservation for residents and adopted a zoning bylaw that has enabled the photovoltaic array now planned for the town’s capped landfill. The Outer Cape Energize effort is a public outreach program that helped residents install solar panels on their homes, encourages energy efficiency through home energy audits and subsidized home improvements, and conversion away from greenhouse gas producing methods of home heating towards cleaner heat sources.